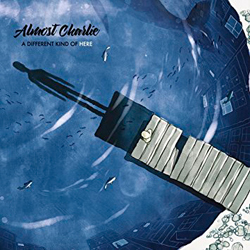 Almost Charlie are a collaboration between Berlin based composer Dirk Homuth and New York based lyricist Charlie Mason and A Different Kind Of Here is their third album under the moniker. Recorded in Berlin the album features Homuth on various strings and things and vocals, his wispy voice couched in various settings, gentle pastoral reveries, woody string backed settings and piano based ballads with an occasional moment of briskness allowed to intrude. Listening to the album one gets the sense that Homuth is happiest in some Elysian field where John Lennon has left scraps of his less scabrous writings, his utopian visions such as No. 9 Dream and Imagine along with a whiff of Strawberry Fields. In addition, shades of Al Stewart and the bucolic sweetness of Pink Floyd’s post Barrett frolics in Grantchester Meadows ripple throughout. As such the album is a dappled trip with sunny and autumnal hues variously colouring the songs. It’s not exciting per se but there’s no denying the craft that’s gone into its construction. A song like Defective approaches a Robyn Hitchcock like sense of mystery while The Loneliness Of Sharks is reminiscent of Momus’ melancholic baroque pop. However much of the album skips by like a will o’the whisp, a momentary delight. Robot is rooted in Lennon psychedelic whimsy and the title song although attractive is ultimately as fleeting as a snowdrop. Except for Her Name is on a par with the best of Jeff Lynne’s Beatles’ pastiches and the opening Shadow Boy is a delicate filigree that reminded this writer of Al Stewart’s bedsit days. Overall the album is a delightful confection but not a full meal.